94905 connections made so far with How's My Kid! You work in the child-care business because you have a passion for teaching and interacting with kids. You have a terrific classroom environment, and you lead amazing activities that develop the young minds in your class. How's My Kid helps keep your parents connected with the daily activities of their children, as well as with events at your center. Connecting with your parents will make your classroom run smoothly and will increase parental engagement. 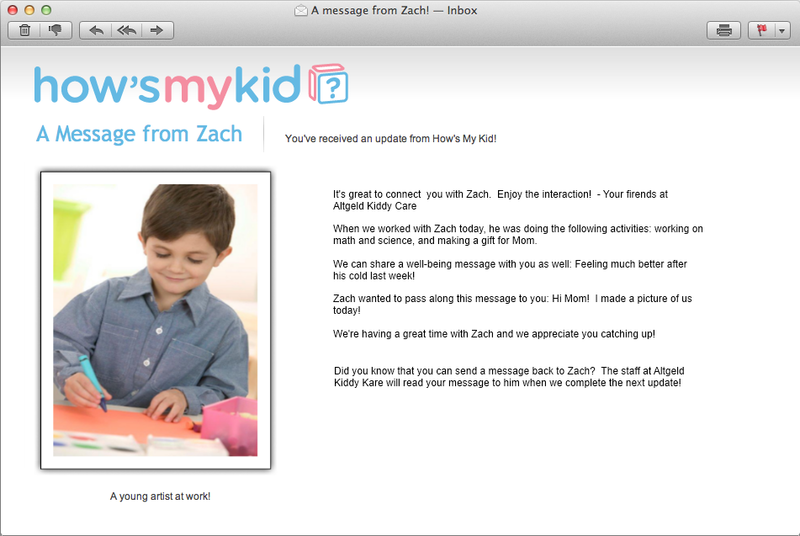 You'll have so much fun keeping in touch with parents while providing these updates! All you need is an iPhone, iPad, or Android device. You won't believe how easy it is! As parents, we really miss our kids when they're at child care. We like to envision who they're playing with, what they're laughing at, what they're doing. Child-care centers are where kids have many "first" experiences. If your son or daughter is in a child-care center, you want to be part of the learning and development that takes place there. How's My Kid keeps you connected to your little one while they're in child care. With How's My Kid, you receive full-color updates on your son or daughter's activities from a teacher at the child-care center, directly to your email! And the best part is that How's My Kid is free to you! Just ask your child care center to sign up for the service, and they'll take care of the rest! Click on the image below to see a sample update!